Peel the squash and cut in half lengthwise. Remove seeds and cut squash top to bottom into long thin slices about 1/4-inch thick. Brush slices with extra virgin olive oil, sprinkle with salt and pepper, and place on a hot grill for 3 minutes. Turn slices over and grill for another 2 minutes. 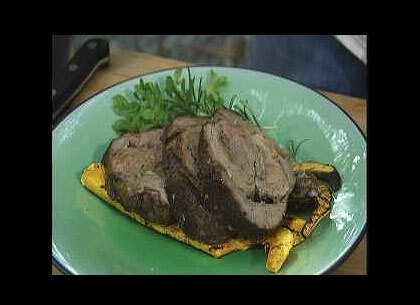 Plate the squash slices and top with sliced roasted lamb or grilled sliced beef. Drizzle with extra virgin olive oil and garnish with fresh herb stems. This segment appears in show #3207.